Perfect size sign for office, dorm, bedroom, desk, or countertop, a rustic accent with special words, 6.5" x 4.5". Wood mini-sign with dowel for stand-up display; an easy gift to give. Be strong & Courageous. 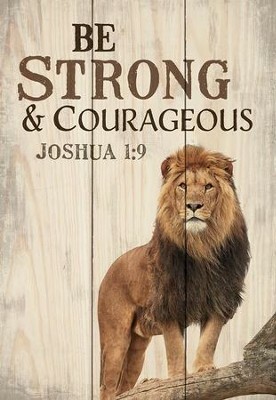 Joshua 1:9 Lion motif. I'm the author/artist and I want to review Be Strong and Courageous, Mini Sign.